Spirit Of America is an emerging Independent Open Class powerhouse that has successfully championed this year’s WGI Worlds. Their 2015 show “Tango; Frost On The Burning Rose” is a detailed exploration of passion and indifference, highlighting the universal emotions of love and hate. All of this is exquisitely performed through the medium of Tango music, as initially inspired by the stylings of Astor Piazzolla. Piazzolla was an Argentinian composer and one of the creators of Nuevo Tango; a tango, jazz, and classical infusion that led to the now popular Neotango, which helps to explain some of the awesome music drumline fans heard from Spirit Of America this season. Dawning a full featured line of cajons, Spirit brought a fresh flavor to the Latin theme, which is often overplayed in the marching arts community. The only single aspect of the show that may have upstaged this ingenious addition could have been the marimba line, featuring a stunning group of performers that were all female. Another very notable element of their show was the performance of the visual ensemble as “the woman who couldn’t be tamed” danced around the floor. She seemed to enchant the members of the battery section, leaving them wanting more, along with the audience. When DOA got our 1st glimpse at Spirit’s 2015 program, we were left with that all too familiar feeling; that love-hate many of us felt in middle school, as the boy or girl we had our eye on somehow toyed with our emotions. At the end of the show, we knew these amazing musicians had just left something very special on the floor. So DOA wanted to find out about the very special place that it all came from. Dan Pfeiffer, the battery section leader says that Spirit Of America “represents the power music has to change lives.” Dan is about 12 years into the organization and says that this line has definitely had a hand in raising him. Introduced to some of his most positive mentors, Dan says he draws on Spirit’s influence for many real life situations. Front ensemble section leader, Kirsti Pugsley describes the unit as “dedicated to the education of young people.” She too notes the application of Spirit’s teachings in the day-to-day world. Both performers sited attributes such as teamwork, discipline, and endurance as ideals that Spirit Of America puts forth to their students, and they are both so grateful to have that. When asked to comment, Ian Hale, Spirit’s percussion director said that he just lets the music guide him through his teachings. 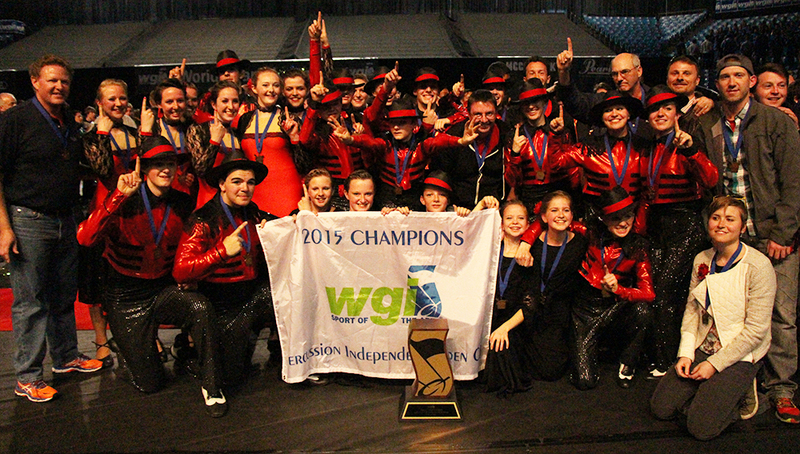 Many would say well played, since it guided his drumline to a WGI championship win this season. Hale was asked about the moment Spirit was announced as the PIO champion, “It was an incredible moment for all of us…” DOA couldn’t help but feel that in this description, Hale wasn’t only speaking about that one specific moment. He was describing a season full of determination, exploration and endeavor, in all aspects. He was describing the values that he had instilled in his students. Hale was describing the love and the bond that the “sport of the arts” creates between teammates. Spirit represents all of these things to the fullest extent. Spirit of America represents exactly what a true team spirit should be. DOA would like to thank Ian Hale, Kirsti Puglsey, Dan Pfeiffer, and Sharon Tingley for the time out they took to spend with us. Best wishes to Spirit Of America for the future.